P.S. : I was actually inspired by the perfect new design of your blog, Lilli! I am still in a search for the one I like the most for mine. Look carino, gli orecchini mi piacciono molto. Ciao Lilli, devo dire che il cappello ed i guanti con il micio ti donano molto. 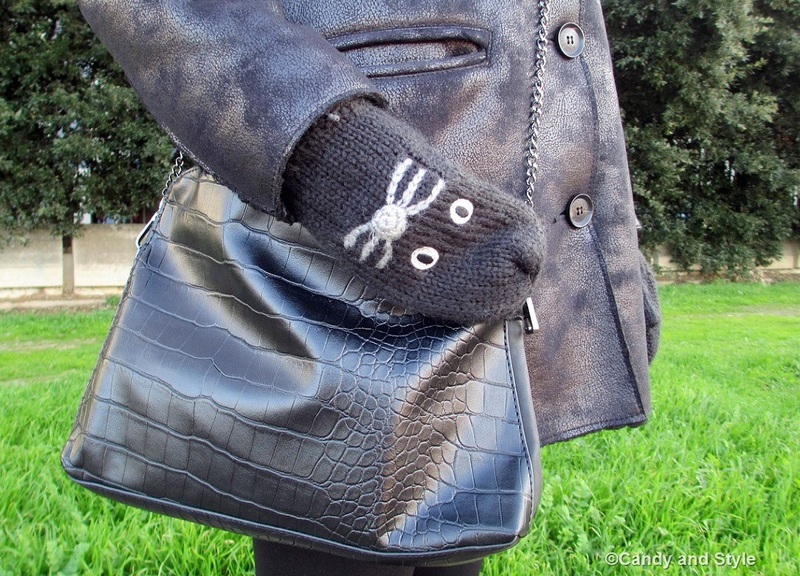 Trovo il look spiritoso ma chic! Un caro saluto e buon week end. Ma questo cappellino lo voglio anche io! MI PIACE TANTISSIMO! Anche il cappotto mi piace, sembra caldissimo....! Eccolo il beanie che hai comprato Lilli!!! È troppo bello, poi si vede che faceva un gran freddo! Davvero molto carina!!! Il cappellino e i guanti sono simpaticissimi! e vedo che hai cambiato grafica del blog, mi piace!! I think it's a cat! 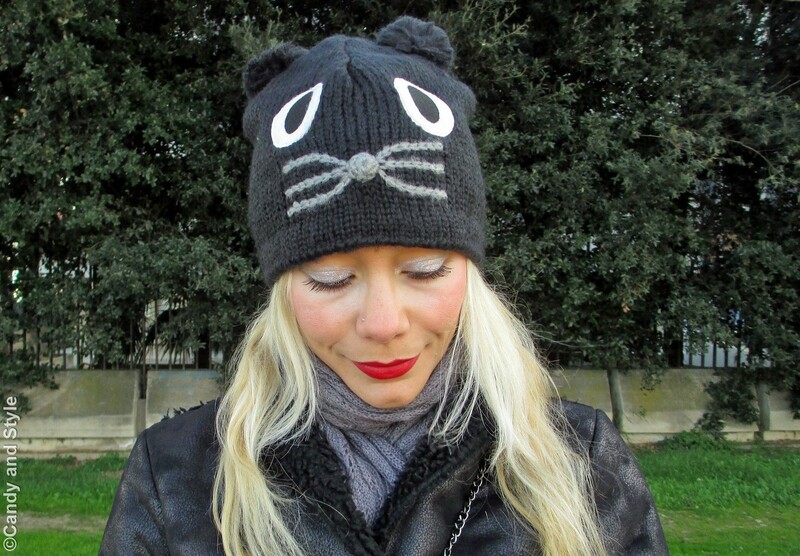 Lilli ma il cappellino è troppo carino e che belli gli stivali! Buon week end cara! I love this minimal look. And the hat look super cute too. How cute is that beanie and gloves?! You look super adorable! I know what you mean by the cold wind, it's the same here where I live. There's no snow but lots of rain and cold wind. It sure is a kitty!! I like your beanie and mittens! !So cute!! And what an amazing outfit!You look gorgeous! Hope you have a happy weekend!Hugs! Si è un gatto ed è tenerissimo... mi piace questo total black reso meno "banale" da simpatici accessori!!! Bella la texture del montone eco! Ecco come combattere freddo e vento con stile!!!!! Good start for the weekend! You look so classy Lilli. Love the coat and bag! Many kisses! Have a great weekend!!! Oh your kitten beanie and mittens are just darling Lilli! I'm glad to hear they kept you warm on this windy day and you look so pretty and chic as always. Have a wonderful weekend sweets! Lilli, that hat is the absolute CATS MEOW! Oh how cute it looks! Love that you're wearing black and silver with it. Looks so good together. I LOVE your new layout! Very chic my friend! Dear Lilli, i think this is a mouse and such a cute mouse. :) Your outfit is exactly right for icy days. The jacket looks snugly warm. And I am certainly the sweet beanie and the gloves protect you also well against the cold. With the boots your outfit has a light rocky touch. Great Look dear Lilli!! Beautiful look my dear and wooow I am loving the cleared new layout!!! ciao Lilli , mi piace molto la nuova veste del blog!!! tu sei splendida, adoro il tuo cappellino!!!! Hi Lilli, your beanie is so cute. Just adorable. Your boots are so nice too. Enjoy the weekend! 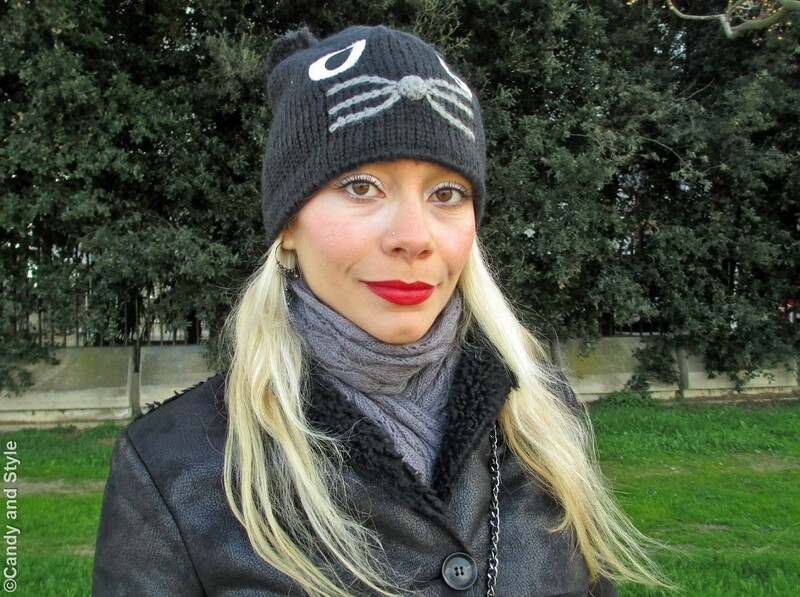 no vabbè troppo carino il cappello. A me piace qualsiasi cosa con le orecchie e sono arrivata anche a quella cosa un po' infantile di incollare le orecchie sul casco. W gli orsi. E tu stai proprio bene in all black Lilli. un bacino e che sia un sabato favoloso. ciao cara...sei una splendida gattina!!!!! buon weekend! You changed your blog layout, Lilli. I quite like my current one as it took me some time to get the white and pink theme with cats together. But I do want to change the typography of my blog. I thought of using a clean readable font and try to maintain the same style of fonts throughout. Your new layout looks so clean. I'm always in favour of super white minimalist, clean feel. On to your beanie. It is definitely a kitty. And the mittens... OMG... I didn't expect the beanie and the mittens to be a match. SO cute! Hihiii, the cutest kitty! :) So adorable your look, Lilli! Il constrasto dentro tu biondo capelli and the black of your closes is perfect per evidenziare la tua bellezza! Your jacket is so classy, I love it - it will always pass the test of the time! Beautiful outfit, year! You're an inspiration to me! Have a relaxing weekend! Many,many kisses! P.S. May I ask you a question? I was wondering why I can't let comments to older posts of your blog? :) Thank you! How cute is this? Looks great Lilli; love it! I bet it's a kitty-- a black kitty hehehe..
Sei adorabile con questo cappellino e questi guanti, sono così carini! The beanie and mittens are so, so cute. Gorgeous booties too. mi piace tanttissimo questo look Lilli, stai benissimo! Un bacio. Definitely a black cat! Love it! I'm a big fan of cat inspired fashion. This beanie is so lovely! quanto è bello questo completino coordinato? anche i guanti sono deliziosi! mi piace molto anche il trucco, è bianco o grigio l'ombretto che hai applicato? Che bello questo cappellino. un abbraccio Lili! Lilli!! Lo voglio anch'io quel cappellino!